The Marquis of Wythebury, is expecting an ordinary Christmastide at Hurst—until he is set upon by a beautiful miss who takes him to task for not allowing his young nephews to play outside. In his mind, a five and seven year old needn’t get chilled in the snow; better to plop them in front of the fire with a book. Few people have ever been brave enough to challenge him over anything, much less the rearing of his wards. The cheeky Miss Prim has no such compunction. No matter how fetching he finds her, he can’t give in to his attraction…for she is the sister of his best friend. Growing up the middle child of five rambunctious girls, Lillian Prim doesn’t understand why two young boys visiting Hurst don’t know how to play until she meets their dashing guardian. The Marquis of Wythebury is commanding and intensely serious-minded. To her surprise, she’s captivated by him. It’s all she can do not to give into her feminine fantasies about her kissing him. Lillian has no intention of falling in love with the Marquis, but she will create Christmastide mischief and teach the boys and the handsome Marquis how to play, in Mistletoe, Mischief, and the Marquis, by New York Times bestselling author Amelia Grey. Being a fan of Amelia Grey's The Heirs' Club of Scoundrels series, I was eager to read this holiday novella. On the pages, there is everything you expect: a holiday house party, featuring kids and matchmaking, giving a glimpse of past narrators readers love. Being that it was a shorter novella, the romance was the sole focus without major buildup. Perhaps it was my mood, being that I'm more stuffy like Seth, I just couldn't deal with Lilian's childishness. I understand how the author was trying to balance their personalities, but I couldn't see her as a grown woman worthy of marriage and a family of her own. There was the foundation of push-pull, tension-filled, love-hate romance with a ton of banter, but it all felt forced from the get-go, and got thicker and harder to digest as I read along. The initial meeting, where Lilian engaged with Seth's wards, between their dialogue was paragraphs and paragraphs of lusty description. I wasn't sure if it was a description, or if the author was trying to sell the reader into courting the characters themselves. Lilian and Seth were so hyper-focused on the shallowness of the physical, the reader didn't get to know their personalities. Using dialogue to show who they were, I was distracted by the amount of inner musings about how delicious the narrator thought the other was. Seth is the guardian of his 7 and 5 year old nephews, after his sister and her husband succumbed to illness after being stuck in the cold. On the way to the house party, the boys' governess succumbed to illness, also after being in the cold. So when he finds his nephews with Lilian having a snowball fight, he is obviously nervous. Lilian came off as believing she is right, no matter what. Whether Seth is wrong or not, is not up for debate. He is their guardian, and his job is to protect their welfare at all costs. Lilian is a stranger making demands the instant she meets Seth. While some readers may find this overstepping to be by a spunky spitfire heroine, I found it to be disrespectful. It's not unreasonable that Seth wouldn't want his nephews to fall into ponds through broken ice (Lilian disregarding it because it was only to the ankles, as if it didn't take a long time to get home in order to dry off. We're talking a long horse and carriage ride in freezing temperatures with wet shoes and socks, not a car with heater), or stay outside for at least two hours a day in the frigid air. Especially after they were exposed to a contagious governess. But, obviously, Lilian is in the right, and Seth is just a stifling guardian... and those who read and loved this novella think me exactly like Seth (shrugs). There is balance between the two. The uptight, nervous guardian and the flighty, immature girl who wants to watch after the children. Sure, Seth needs to make sure they have fun, but Lilian reminded me of someone who would not only allow them to play in traffic, but push them into it. The butting of heads over the children's welfare versus their fun was the tension for this romantic holiday novella. I do believe most historical romance fans will enjoy the book, as well as those who have read and enjoyed the series. It wasn't to my tastes, finding it difficult to enjoy a story where one of the narrators rubs me wrong. Truth be told, my fellow serious readers, read the sample. The majority, no doubt you will be delighted and enchanted by this holiday romance. For reviews & more info, check out our stop on The Duke in My Bed Blog Tour. 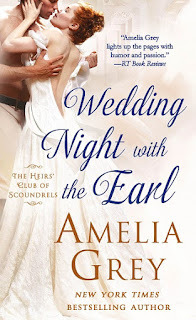 For reviews & more info, check out The Earl Claims a Bride post. For reviews & more info, check out Wedding Night with the Earl post. New York Times and USA Today bestselling author Amelia Grey read her first romance book when she was thirteen and she’s been a devoted reader of love stories ever since. Her awards include the Booksellers Best, Aspen Gold, and the Golden Quill. Writing as Gloria Dale Skinner, she won the coveted Romantic Times Award for Love and Laughter and the prestigious Maggie Award. Her books have sold to many countries in Europe, Indonesia, Turkey, Russia, and most recently to Japan. Several of her books have also been featured in Doubleday and Rhapsody Book Clubs. Amelia is the author of twenty-five books. She’s been happily married to her high school sweetheart for over thirty-five years and she lives on the beautiful gulf coast of Northwest Florida. Reviewers on the Wicked Reads Review Team were provided a free copy of Mistletoe, Mischief, and the Marquis (The Heirs' Club of Scoundrels #3.5) by Amelia Grey to read and review.